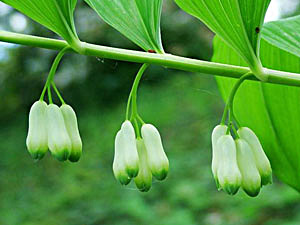 Solomon's seal has been used for thousands of years in herbal medicine. It is used mainly in the form of a poultice and is believed to prevent excessive bruising and to stimulate tissue repair. The root is astringent, demulcent, emetic and tonic. An infusion is healing and restorative, it is good in the treatment of stomach inflammations, chronic dysentery etc. 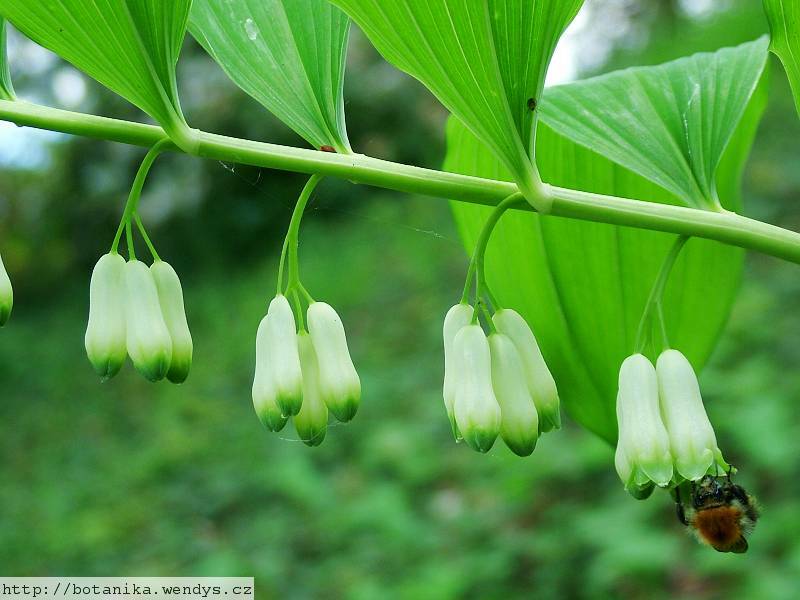 It is used with other herbs in the treatment of pulmonary problems, including tuberculosis, and women's complaints. The powdered roots make an excellent poultice for bruises, piles, inflammation etc. The root is harvested in the autumn and dried for later use. The plant should not be used internally except under professional supervision. A distilled water made from the whole plant has been used as a skin tonic and is an ingredient of expensive cosmetics. The dried powdered roots and flowers have been used as a snuff to promote sneezing and thus clear the bronchial passages. Young shoots - cooked. Boiled and used as an asparagus substitute, they make an excellent vegetable and are widely used in Turkey. Root - cooked. Rich in starch. The root should be macerated for some time in water in order to remove bitter substances. Normally only used in times of famine, the root was powdered and then made into a bread by the North American Indians. Plants can be grown for ground cover when spaced about 30cm apart each way. A distilled water made from the whole plant is used as a cosmetic to improve the complexion. Seed - best sown as soon as it is ripe in early autumn in a shady part of a cold greenhouse. Sow stored seed as early in the year as possible. Germination can be slow, they may not come true to type and it takes a few years for them to reach a good size. When they are large enough to handle, prick the seedlings out into individual pots and grow them on in a shady position in the greenhouse for at least their first winter. Plant them out into their permanent positions in late spring or early summer, after the last expected frosts. Division in March or October. Larger divisions can be planted out direct into their permanent positions. We have found that it is better to pot up the smaller divisions and grow them on in light shade in a cold frame until they are well established before planting them out in late spring or early summer. Large quantities of the fruits are poisonous.